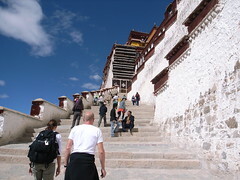 We are now in Tibet and had one night/day in Lhasa. altitude is tiring - we are at 3800 metres in Lhasa and scoffing Diamox (we were forced to) which helps with altitude sickness but is a diuretic (you pee loads). My laptop has blown its hard drive I think (which is why you are getting this crappy photo for the update). How does this make me feel? Pissed. Bianca's hair goes straighter in dry weather.